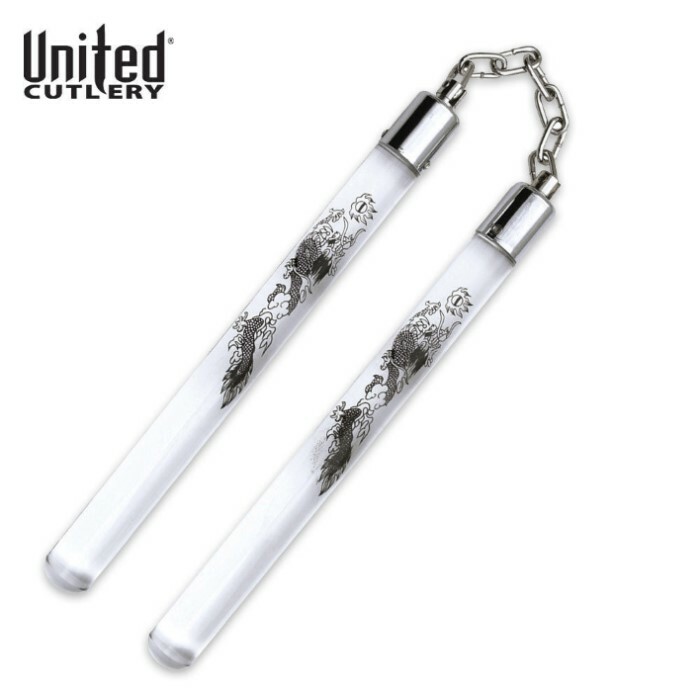 United Cutlery Dragon Acrylic Nunchakus | BUDK.com - Knives & Swords At The Lowest Prices! 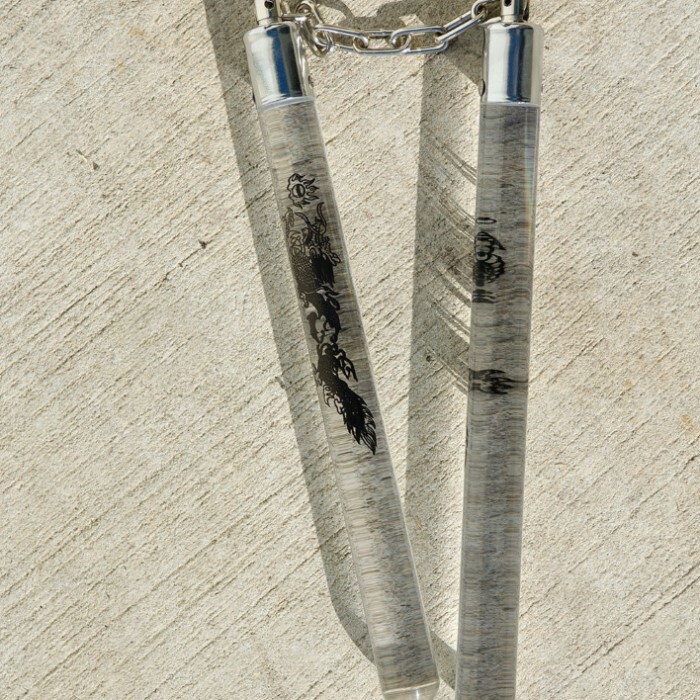 Get the coolest nunchaku on the block with these clear acrylic "chucks" from United Cutlery. These are ok. It seems just as I was getting momentum and accuracy I dropped them on the tile floor a little hard and one stick broke right in half deeming them not useable, I would go with the wooded ones if you were thinking about getting these, unless you like the design. Overall good product but not for beginner if you are going to drop them alot. I bought these things a while back and thought it looked amazing; purpose of me purchasing it; really worth the value. Then just a month ago I actually started to use them having no knowledge of these at all. These are the real deal and now I know why nunchaku are considered lethal weapons. They're really sturdy, got a teensy bit scratched after a month of hitting walls and desks by accident, but you can't even notice because it's clear. I've hit myself about 4 times now and 2 I was sure I broke something and almost did... be careful! These are a great investment. Great for personal defense or home defense. I've hit many things with them, including myself on accident and i can honestly say that I would NOT want to get hit with them from someone else, so that's how I know they are great, plus the swivel design at the connecting points are genius. I would recommend these to any enthusiast or to anyone who simply likes to fool around with them because the action is quite smooth indeed. :) SATISFIED TO THE MAX.